Ask any aquarist one greatest problem faced, you’ll most likely hear “algae growth”. While this problem is common among most aquarists, there is no one best solution to deter its occurrence. Having the right amount of algae growth leads to a happy tank, but excessive growth can be unsightly and hazardous to all organisms in the tank. Algae usually grow in freshwater such as lakes and water reservoirs. They can easily be identified by the colouration of the water due to the high density of pigmented cells. Algae is a diverse group of plant-like organisms and can occur in a wide range of environmental habitats. In an aquarium, algae fulfill two roles – producing oxygen through photosynthesis (yes, they have chlorophyll even if they’re not always green) and acting as a food source for fish and other aquatic animals such as shrimp and snails. While algae, especially a large chunk, isn’t aesthetically pleasing to the eyes, they are the most important living organisms on earth. They produce an estimate of 70 to 80% of oxygen in our atmosphere. Ironically, having excess algae growth in the tank does not equate to better oxygen for your tank. Instead, an algal bloom can suffocate other organisms. This is because when night falls, or in the absence of light, the algae which have grown so healthily and rapidly requires more oxygen for respiration. All the living organisms fighting for the limited amount of dissolved oxygen in the tank sounds like the best way to suffocate them. As algae starts to grow in excess near the water surface, it blocks out sunlight necessary for other aquatic plants to produce oxygen and make food. And you can probably guess it by now – reduced light penetration, insufficient food and oxygen, and ultimately the death of all aquatic animals (except algae). Other than blocking out light, algae also produces hazardous toxins such as microcystins, a neurotoxin that destroys nerve tissues of mammals. Aquarium placed under constant and direct sunlight. Yes, it must be beautiful and calming to see sunlight being reflected off the clear water in the tank. 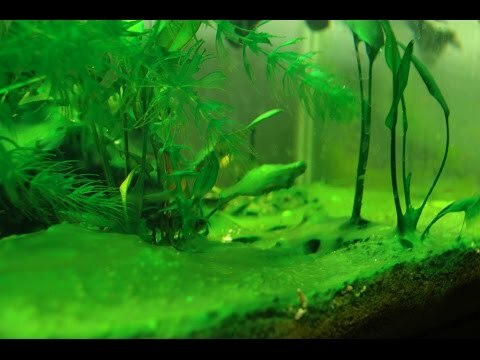 Congratulations for creating the perfect breeding ground for algae! Algae functions like plants – the more light, the better the growth. If your tank had been strategically placed under the sun, try shifting your tank to somewhere less bright. However, if your tank is too huge to be shifted, you have no where else to place the tank or simply due to fengshui, you can consider covering the sides of the tank with black cloth and switch to aquatic lamps instead of relying on natural lighting. An alternative will be to install curtains and draw them whenever it is too bright. Overexposure under aquatic lamps. Sunlight or lamps, as long as they light up, algae will thrive. Similar to the aforementioned cause, switching on aquatic lamps for prolonged periods of time will lead to quicker algae growth. The solution? Find the optimal amount of time to turn on the lights. Some aquarists prefer switching on the lights for a few hours at night since there are some light during the day time, depending on how bright your room is. As a guideline, do not expose the tank to lights for more than 12 hours. Overfeeding your fish. When humans can’t finish our food, they go into the trash. What happens when fish can’t finish their food? They translate into algae growth. Overfeeding leads to increased phosphate levels in the water, which is great news for algae because they only require a small amount to thrive. One solution is feed small portions and watch the fish eat. Excess food not eaten must be removed immediately rather than “leaving it as supper for your fish” – if you don’t eat overnight food, your fish probably don’t too. A great preventive measure would be to work out a feeding schedule if you’re not the sole owner of the tank. Water source is rich in phosphate. Test your water source before filling up the tank. Phosphate-rich waters must be replaced. However, if you cannot change the water source, you can consider using phosphate removers. Stagnant water and dirty tank. Performing regular water changes help to keep nutrients in the water at a minimum and prevents stagnant water. Dirty tank, specifically tanks with signs of algae growth must be cleaned immediately. They usually grow on the glass, rocks and other hard surfaces of the tank. You can remove it by scraping and scrubbing the surfaces.